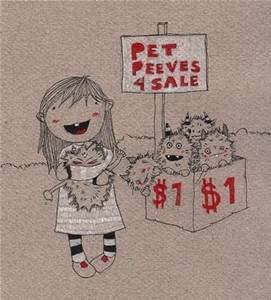 Pet Peeves, we all have them! This cookie might have less fat, but it does not have fewer calories. If you can COUNT items, you must use ‘fewer’. If you can’t count the substance, choose ‘less’. How difficult is that? And when it comes to logic, I get irked when people incorrectly use the expression to beg the question to mean to raise the question or to wonder about something. If I say, Susie is unskilled as a bookkeeper because she lacks accounting skills, then I have just restated my opinion/conclusion instead of providing reasons or proof. No skill in bookkeeping is very close to a lack of accounting skills. I haven’t built any case at all. I have simply reworded my conclusion. My duty still awaits; I must prove my point with reasons and evidence. Sugar, which comes from juice squeezed from harvested sugar beets or sugarcane, must be good for you because it grows in nature. We haven’t actually shown that substances derived from natural plants ARE good for one. The first counter example that comes to mind are certain types of mushrooms, which although ‘natural’, are most definitely poisonous. Voilà a few examples of this logical error, ‘Begging the Question’. Of course we should strive to argue correctly, but more importantly, I’m advocating an accurate USE of the English language to avoid confusion. Just so you know, I don’t ‘buy’ the possible comeback that language evolves, that as soon as a word or phrase comes to be accepted by many, then it has a new legitimized meaning. Question: What do YOU think about sticking to the formal meaning of a word or phrase versus going with the tide of general usage? ← Logical Gal and what’s so wrong with a polemic? Is Legitimatized a word? Just kidding, what is your reasoning behind the thought that a word incorrectly used is not a word re-defined? I think we need to hold ourselves and others firm to an established definition. But a more important principle is that at the start of a discussion, we must clarify terms and establish agreement. If both parties disagree on what a term means, then a subsequent discussion would be futile. Thanks for catching my ‘legitimatized’ – I’ll fix it!